Kevin Cloud is the most humble superstar you'll ever meet. A member of id Software's storied development team since before anyone had ever heard of the company, his name has nevertheless been overshadowed through the years by the company's higher profile designers, both past and present. Less incendiary than John Romero, less flamboyant than American McGee and less cerebral than John Carmack, Kevin Cloud has nonetheless left his mark on the 17-year-old company and the blockbuster games bearing its name. Starting with id in 1992 as an artist, Cloud has worked side-by-side with original artist Adrian Carmack on the original Wolfenstein 3D, Doom, Quake and most of the installments of both blockbuster franchises since. These days however, as co-owner of the company that Doom built, Cloud has taken more of a management role, overseeing multiple cross-platform production teams hard at work on Enemy Territory: Quake Wars, coordinating with longtime id partner Raven on a sequel to Return to Castle Wolfenstein, and producing a new title they can't yet talk about. Small wonder he considers a chance to actually make art for a game "relaxing." "I still work on artwork," Cloud recently told The Escapist, "although right now I'm mainly focusing on working with Raven on [the Wolfenstein sequel] and working with the development teams on Enemy Territory. As soon as I get some time I'll want to do some art work on the new game. "Unfortunately everyone that's been hired around me is just so good. ... I take on work I don't think they'll want to do 'cause it's so boring. If there are any crates or something like that nobody wants to texture, I'll jump in. ... And actually for me that's kind of relaxing to get in and do pixel work like that. " 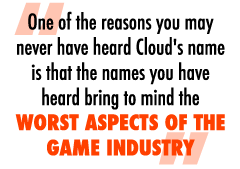 One of the reasons you may never have heard Cloud's name is that the names you have heard bring to mind the worst aspects of the game industry: big egos, out of control production cycles, Behind the Music-style burnouts and game designers being treated (and acting) like rock stars. But these days, with the excesses (and headlines) of the company's early days behind it, id is the company you never hear about, unless it's talking about games. And the people making those games, with a few rare exceptions, are the people who've been making them from the beginning. I asked Cloud what the secret was to id's success at retaining key talent, a skill just as coveted as technical prowess. "We're a small company," he said. "Everybody who works on the game is really important to the game. There's nobody who's lost in the mix. We hire really, really good people and do our best to try to keep them. I think that it creates a real sort of team. A real focused team of people that know each other, know they make a big difference and know it's going to be a really good game. And I think that keeps people around." It also can't hurt that one of id's co-founders, John Carmack, is still around, still making top-shelf game engines for id and still pushing the company to the forefront of the industry he and his company helped create in the 1990s. I asked Cloud what it was like working with one of the most influential men in games.